As percussionists, drummers should never be limited to their drum kit.That is why companies like Rhythm Tech have created a line of percussion add-ons to the basic drum setup. Adding a tambourine to your set will give you that extra voice of variety that most songs beats can utilize. But with so many different models out there, it is hard to find the best sounding one. 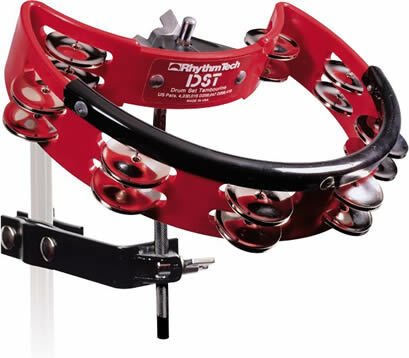 Introducing: Rhythm Techs Nickel Drum Tambourine. The first thing I noticed upon opening the box to this was its stylish looks. Although it is only a tambourine, the design of this model is very drum friendly. There are many tambourines that have a boring circle shape, with one solid color. The Rhythm Tech; however, comes in four different colors. Black, Red, White, and Midnight Sun. This makes it possible for drummers to match the colors, or personalize their drum set even further. The ‘happy face’ shape of the tambourine also ads flare to any set up. The only downside to the design is its’ size. It is rather large for the purpose it possesses, and may look a little out of place on some kits. One of the best selling points to this tambourine is its compatibility. With its’ design, you can clamp it to any rod, tube, or stand any where from ¼” to ½”. This is perfect for attaching this to anywhere basically. I had them hooked up to my hi hat, as well as a cymbal stand. Having it hooked up to your hi hat stand right above you hats is a nice feature. Unfortunately, due to the size of the tambourine, it almost completely covers your actual hi hats. This is a big disappointment for those who like to play both at the same time. Another reason this tambourine is very compatible, is it comes with an extra plastic pad on the rim of the tambourine. With this, you do not have to worry about cracking the base by hitting it too hard – which we all know happens when we get a little excited! The added support adds strength and protection to the tambourine. For a tambourine that is built for abuse, the sound was impressive. With most tambourines I have played, they are very personal to their use. For example, some sound good being hit, while others sound good being shook. The Rhythm Tech, however, sounds great with all applications. Whether it’s being tapped on my hi hat, hit with my stick, or shaken in my hand, the tambourine delivers warm even sounds. For the price of the tambourine, I was surprised in how rich the sound was. I found it a little hard to get volume from it though. Where the sound is great, the volume of the tambourine itself is not as loud as it looks it should be. This poses the problem of being drowned out by other instruments. For the price of 20-40 dollars, you can have your own Rhythm Tech Tambourine, and be adding spice to your beats in no time. With the compatibility to be used on any kit, of any color, this is truly well worth the money. Aside from the larger size, this Tambourine really delivers, and should be an accessory on every kit.